Every man wants to project his personality with the way he dresses and by the way he speaks. 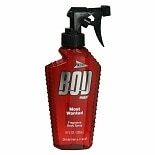 Don't neglect to engage that other, most basic and seductive sense with the masculine scent of BOD Man Body Spray. The selection of sprays, each with a special scent profile, engages and draws in women. The fragrances combine with a man's own natural, clean scent, triggered by the warmth of his body, to create a long-lasting presence that is uniquely his own. Don't be surprised if you receive compliments about how good you smell. It happens to men who wear BOD Man body sprays more often than you think. Each morning when you get out of bed, or after every workout, it's time for a new beginning. Just out of the shower, your body is clean and fresh. It's a blank slate on which you can write your personality. 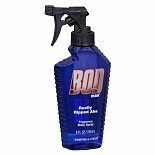 Combine the special blends of BOD Man body sprays with the natural scent of a man. The warmth of your skin will activate the carefully formulated contents to create a presence that is as unique as yourself. The scents complement your own clean, fresh skin, creating a blend that compels women to come closer. What happens next is up to you. The variety of styles available from BOD Man body sprays gives a man a choice for any situation at any time of the day. Select one in the morning. You might choose a fresh, marine scent, for work or play time. Freshen up after an afternoon workout or friendly game on the courts in time for that dinner at your favorite restaurant with your best girl. You might choose to get a little dangerous with a muskier, masculine selection. For that long weekend in the country, pack a bottle of the most daring, seductive scent into your overnight bag. Wherever you go, whatever you do, whenever you need it, the long-lasting but never overpowering scents of BOD Man body sprays will give you a confident edge.